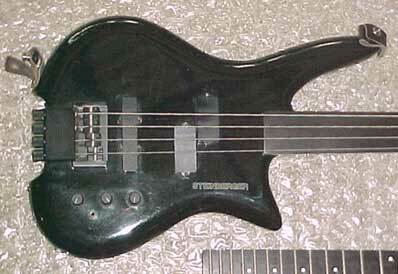 In 1990 Ned introduced a bass featuring a modern stylized body and all of the other features Steinberger basses were known for - graphite headless neck, innovative tuning bridges & advanced electronics. Original Q4 / XQ2 v1 in metallic blue. This one has EMG pickups and a DB bridge. Over the years several complaints were registered about the original Q's. The primary one was the size and weight of the body. 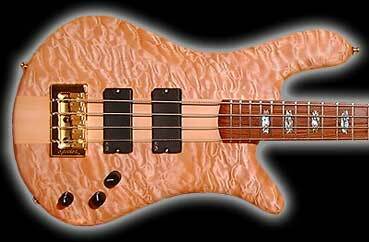 The dense, hard maple body was nearly 1 1/2" thick, which contributed to an overall weight on the 4 string of nearly 9 lbs. (over 10 for the wide 5 version) - fairly weighty by Steinberger standards. Another complaint was the stark design. The body edges were precise and angular. Though modern it seemed to have a rather "cold" look and feel. In the mid 90's Ned (at the request of Gibson) redesigned the Q. 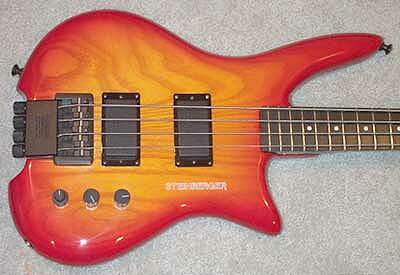 The body was changed to swamp ash, slimmed quite a bit, and the heel tapered. The overall shape was retained but was thinned and curved to be much more rounded and refined. Even Ned admits that he wasn't entirely pleased with the original version (what we now call the v1 body). This redesign brought it closer to his vision. These newer v2 bodies were given a more traditional Steinberger designation by Gibson and officially became the XQ. Translucent honey burst Nashville made v2 XQ2A. To simplify things we today refer to all of the Q's as XQ's. The body styles are commonly referred to as either v1 (original Q4/Q5) or the newer v2. This same v2 body shape is found on the Spirit XZ models sold today though MusicYo. The Q's are available in both a 4 string and wide 5 string version. All of the original v1's came stock with active EMG pickups and active or passive EQ. 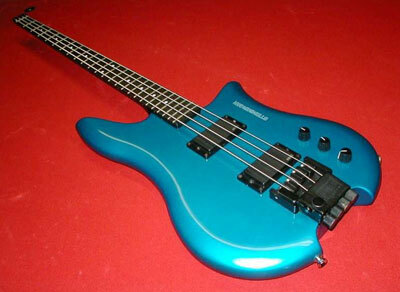 The later Nashville ones came with a variety of pickup configurations: EMG's, Bartolini's (P pickups in a humbucking housing just like the EMG-HB's on the 4's and 5 wide soapbars on the 5's), and Seymour Duncan Basslines. The EMG and Bartolini ones were matched to passive pots or HAZ Labs dual tone active electronic boards (tweaked for each pickup). OEM active electronics on the Basslines were provided directly by Seymour Duncan and often consist of a four knob setup of volume (w/ pull contour switch), balance, dual tone knobs and a midrange knob. We've also seen one v2 XQ that actually had an EMG P-J pickup configuration (XQ3) factory installed, but we've never seen another like it. It's serial number was low for a v2 Q, and we suspect it was either a custom order or perhaps a prototype. Rare XQ3 with an early v2 body. The hardware here was standard bass fare. Regular fixed and DB bridges for the 4 strings and the wide fixed bridges for 5 stringers. 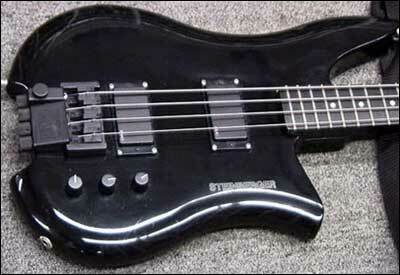 It should be noted that the XQ is the only bass model to not be offered from the factory with a narrow 5 string bridge. By the time the Q was introduced the company had moved toward offering a true wide 5 string bass - the Q5 was the first of these. It's possible some used XQ's sport narrow 5 bridges, but these likely are a post-purchase swap. It's also possible that an XQ could sport a bass TransTrem, as the factory still had a small supply of the bridges left. But we've not seen nor heard of one. The Q's came in a variety of colors. Always available in black and white, early common color choices included metallic red and metallic blue. Once production was moved to the factory in Nashville, the Gibson body shop added a wide variety of transparent and/or burst finishes to the v2 including clear, honey burst (tobacco burst), cherry burst and fire burst. In '98, just before production ended, they even announced the availability of a natural hand oiled version. A Summer NAMM press release (archived on Harmony Central) refers to these as the XB model, but no other references or actual pictures of this instrument exists. We've surmised they were a variation of the XQ and categorize them as such. Only two instruments, both 5 string versions, have been seen. Natural hand oiled XQ-25A w/ Seymour Duncan Basslines pickups and electronics. Note the 4 knob setup. MusicYo will be reintroducing the XQ summer of 2003. Both the 4 and 5 string versions will be offered with the new M/S Blend necks matched to the newer v2 swamp ash bodies. Just like the earlier ones they'll sport EMG pickups run through HAZ Labs active dual band EQ circuits.